PlantTalk:Sequence is an integrated and comprehensive solution to the automotive sequencing requirements. 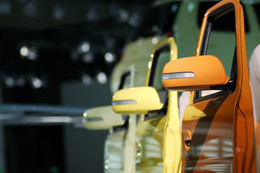 The concept of automotive sequencing originated from the just-in-time initiatives introduced by the automotive manufacturers and their suppliers in the early 1990s. Depending on the manufacturer, the sequencing requirement is referred to by many different names and acronyms, such as in-line vehicle sequencing (ILVS), sequential parts delivery (SPD), just-in-sequence (JIS), etc. The essence of automotive sequencing is for suppliers to deliver parts to the manufacturers just in time, and also in the proper build sequence, as requested by the customers. Generally, sequencing maximizes the manufacturer's floor space, decreases the time a consumer waits for his or her new vehicle, and reduces inventory levels being carried by manufacturers and suppliers. In some instances, the sequenced build information is made available to the suppliers on the Internet, and it can be FTP'd into PlantTalk :Sequence.